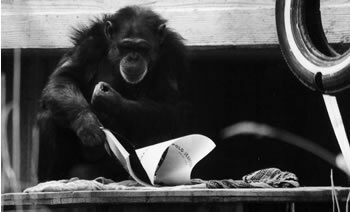 There have been many attempts at teaching chimps to use language. However, some of the earlier attempts were destined to failure as these studies (e.g. Kellogg and Kellogg 1933) were attempting to teach chimps to speak and their vocal apparatus is unsuitable for making speech sounds. 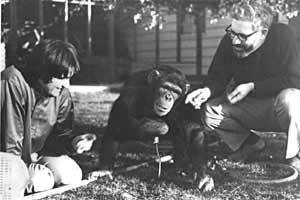 Gardner and Gardner attempted to teach a chimp to use a non-spoken form of language using American Sign Language as used by many deaf people in the USA. It is important firstly to make the distinction between language and communication as much of the debate about whether non-humans can use language or not centres on these definitions of communication and language. Communication is the process of transmitting information from one individual or group to another individual or group. Animals can certainly communicate with each other. The debate is about whether they can use something similar to human language to do this. Language is a small number of signals (sounds, letters, gestures) that by themselves are meaningless, but which can be organised into meaningful combinations and using certain rules to make an infinite number of messages. The aim of the study was to demonstrate that a chimpanzee does have the capability to use human language. The study is a report of the first phase of a training project (Project Washoe) involving an infant female chimp called Washoe. It is a kind of case study whereby detailed records were kept of Washoe's progress over an extended period of time (32 months). Unlike most case studies there was no problem the subject had for which she was receiving help; instead this was a deliberate attempt to change the subject's behaviour in a particular way in order to test a hypothesis. The independent variable can be thought of as the training programme and the dependent variable Washoe's actual use of signs. The Gardners decided to use a chimp as a subject for a number of reasons. The chimpanzee is intelligent, sociable and capable of strong attachments to human beings. Although they did recognise that the great strength of the chimpanzee could cause serious difficulties. Although earlier studies had failed at attempting to teach chimps to vocalise like humans, the Gardners recognised that chimps easily develop hand gestures. The Gardners decided to use American Sign Language (ASL) for a number of reasons. They, of course, recognised the manual dexterity of the chimpanzee but also chose ASL because of its structural equivalence to spoken language. They thought it was also useful because ASL is widely used among deaf people in North America. This would allow the Gardners to make comparisons with deaf children. The Gardners decided they wanted as young a chimp as was possible in case there was a critical early stage at which such behaviour had to be acquired. Because newborn laboratory chimps are very scarce it was decided to obtain a wild caught infant. When Washoe (who was named after Washoe county, the home of the University of Nevada) arrived at the laboratory in June 1966 she was estimated to be between 8 and 14 months. Because Washoe was very young when she arrived, she had only a rudimentary hand-eye control, was only beginning to crawl and slept a great deal. Therefore little progress could be made for the first few months. The Gardners ensured that Washoe had lots of human companions who all had to master ASL. The environment was designed to provide maximum stimulation with as few restrictions as possible. Washoe was taught mainly using imitation and operant conditioning. Operant conditioning is simply reinforcing behaviour which is desired. The Gardners found that Washoe would learn some signs by observing and imitating, but often had to "mould" her hands into the right shapes when they were teaching her new signs. Behaviour was rewarded by praising her and tickling. An interesting feature of human language is the babbling stage when babies make many meaningless sounds of the language. Although, not surprising, during the early stage of the project Washoe did not babble she did make many sign like gestures without any meaning. The Gardners called this ‘manual babbling’. Records were kept about the amount of signing behaviour and number of signs used. A sign was recorded if it was reported by three different observers, as having occurred in an appropriate context and spontaneously (i.e. with no prompting other than a question such as "what is it?" or "what do you want?"). A reported frequency of at least one appropriate and spontaneous occurrence each day over a period of 15 consecutive days was taken as the criterion of acquisition. By the end of 22 months of the programme at least 30 signs met this strict criterion. Washoe was also demonstrating displacement - that is referring to things that were not present. She could also spontaneously combine two signs e.g. "gimme tickle". The Gardners believed that they were able to verify their hypothesis that sign language is an appropriate medium of two-way communication for the chimp. 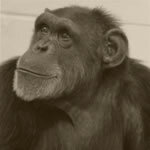 The Gardners at this point of the study (32 months of the programme) believed that Washoe would develop even further in her attempts at sign language and that her achievements would probably be exceeded by another chimp. The main strength of the case study method was the large amount of in-depth data the Gardners were able to collect about Washoe’s use of sign language. However it is worth bearing in mind that, however impressive the results seem, it took a very artificial and production based training programme to get Washoe to this level. This, clearly, is not how human children usually acquire language, so perhaps any comparisons between chimps like Washoe are simply invalid and tell us little about the fundamental question: is language unique to human beings? Perhaps what is required is an example of a chimp learning language in a less structured, more natural context. There are other criticisms of the study, for example it was only a case study of one individual and therefore this makes it difficult to generalise. However a main criticism has to be the ethical nature of the study. I am sure you can make your own mind up about how ethical the study was. Was the study necessary? Should chimps be reared as children? Should chimps be taken from their natural environment? Should chimps be taught something which is obviously 'unnatural' and so on? Not all psychologists agree that Washoe did acquire language. This debate centres on the difficulty of defining exactly what is language. For example she had semanticity (understanding), was able to generalise from one subject to another, was able to demonstrate displacement, and was creative with language as when she combined words. One criterion which is often used as a demonstration of language is structure-dependence (the patterned nature of language and use of "structured chunks" e.g. word order). Although Washoe combined some signs in a consistent order (e.g. "baby mine" rather than "mine baby"/ "tickle me" rather than "me tickle"), she did not always seem to care about sign order, e.g. she was as likely to sign "go sweet" as "sweet go". This lack of structure dependence supports the argument that only humans have an innate propensity to acquire language. The Gardners use of ASL has also been criticised as it is argued that by just concentrating on hand language ASL is not as related to spoken language as it could be. However it should also be noted that although the study which we are reviewing was written when the teaching programme was 32 months old, the programme was still carried out by the Gardners until Washoe was five. By the time she was 4 she was able to sign 132 different words. She could also make over 30 two and three word combinations. This isn't very impressive by comparison with a human 4-year-olds 3000 or so words, but it's still far more than many people had previously considered possible. The Gardners also devised a double-blind test, to rule out the possibility that Washoe's performance was simply a matter of her trainers seeing what they wanted to see in her behaviour. In this test, one observer was positioned in such a way as to be able to see the picture that Washoe was being shown. The other observer was placed in such a way as to be able to see Washoe, and the sign she was making, but not the stimulus picture. Washoe was asked to make the sign for each picture, and the observer had to write down what she had signed. The procedure was also videotaped. Gardner and Gardner found that, under these circumstances, Washoe achieved accurate signing on 72% of the trials. In addition, when she did make mistakes, she would often give the sign for something related to the picture, like giving the sign for a cat when she was shown a picture of a dog. Washoe was now also able to coin new words: the first time she saw a swan her trainer asked her 'What's that?' and she responded with 'water bird'. Washoe would often sign spontaneously, initiating sign language 'conversations' with her trainers. She also, quite spontaneously, developed 'swear words' - words which she added on to her other utterances to indicate displeasure. For example she would sign 'dirty' before someone's name if they had displeased her. The implications, then, is that she was using the words she had learned to fulfil communicative intentions: she was actually using language, rather than producing stimulus-response behaviour.